Where do I start? There’s a lot of exciting things going on, like free gifts and giveaways, so keep reading until the end and follow closely! 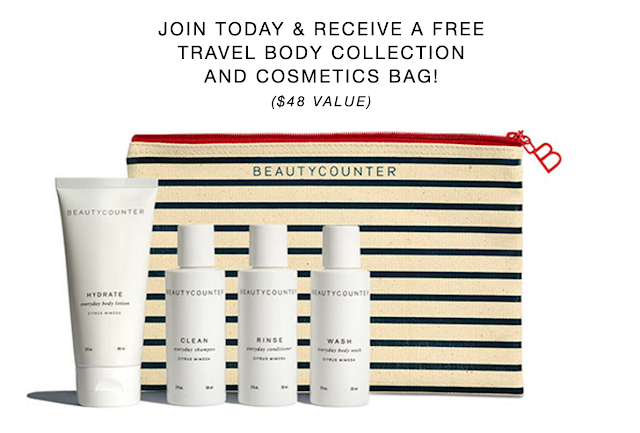 First I’m going to talk about some favorites, then I’m going to talk about a Beautycounter special that’s going on, and then let’s talk giveaway! And if you’re unfamiliar with Beautycounter, you may want to start off with this post first, which is all about why I switched to safer. 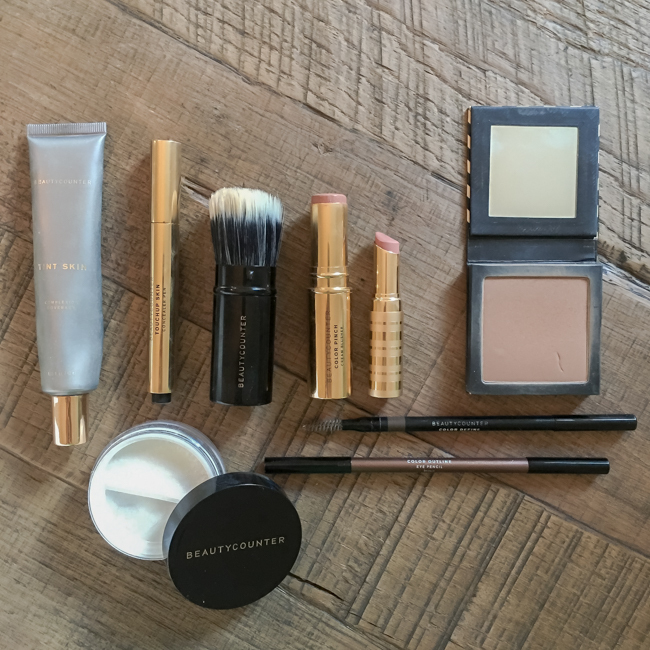 It’s been almost a year since I’ve started using Beautycounter products, so I really feel like I’ve honed in on my absolute favorites. There’s really little from the line that I don’t like, but I’ve finally discovered the products that I for sure do not want to be without. Tint Skin Foundation: This isn’t the most high coverage foundation, but you can layer it up for more coverage. I love it because it it doesn’t ever look cakey, doesn’t settle into fine lines, and it never looks greasy on my face. It’s one of Lauren Conrad’s favorite daily products! I also feel like this is important if you’re only buying a few Beautycounter products because this is coated over your entire face (or most of it), so it needs to be safe! Many foundations contain Polyethylene glycol, which is a PEG and is often contaminated with measurable amounts of ethylene oxide and 1,4-dioxane, which are both carcinogens. Touchup Concealer Pen: This is great because it’s an actual concealer, rather than just a highlighter like a lot of pens seem to be. I use “Light” on my face + undereye, then go back in with “Fair” to lightly highlight under the eyes, down the bridge of my nose, around my nostrils, and in between my eyebrows. Retractable Complexion Brush: The best way to apply the foundation! Color Pinch Cream Blusher: In “Caramel,” specifically. I just love this stuff because of how natural it looks and how easily it blends. You can even put a little bit on the eyelids as an eyeshadow base. Lip Sheer: These are a huge favorite for me, but I think my all time favorite shade is Twig. It’s the best natural shade. I know we basically eat lipstick throughout the day as it wears, so it’s very important for me that my lip products are safe! Matte Bronzer #1: Contain Porcelain Flower Extract (a Thai bloom known for its antioxidant benefits) to help moisturize the skin so it looks radiant. Mattify Skin Finishing Powder: Gives skin a satin finish and never leaves a white residue! Beautycounter is currently switching Eyebrow Pencil and Eyeliner manufacturers, so I’m sorry I pictured those two! They will be back soon though! I think the skincare is the real shining star of Beautycounter. I love, love, love it!! Here’s what I use every day. Nourishing Rosewater Mist: I fell in love with this stuff over the summer. It’s a great midday refresher and I also use it as a toner in the mornings before I put on my moisturizer. Nourishing Cream Cleanser/Routine Clean: So gentle and leaves skin hydrated! Cleanse twice in a row if wearing makeup (this goes for any skincare). Many facial cleansers use common cleansing agent sodium laurel sulfate, which can cause irritation and trigger allergies. It is often contaminated with 1,4-dioxane – a cancer-causing chemical. 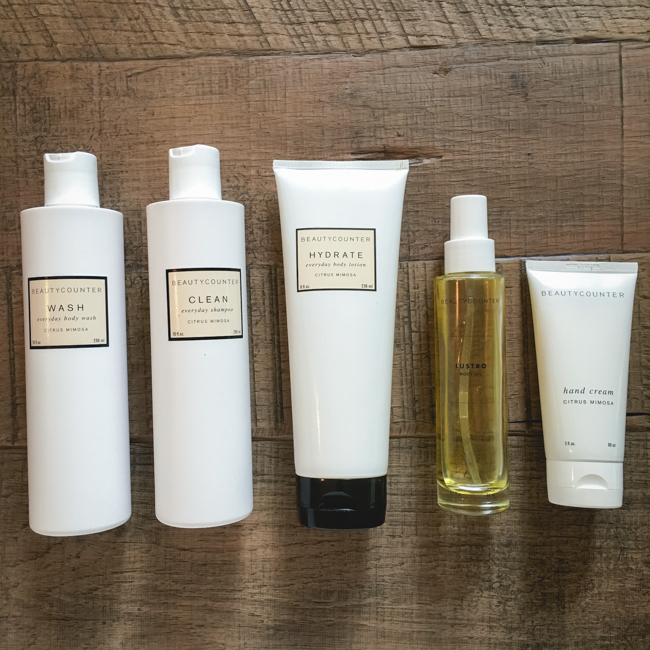 Routine Clean uses sugar-derived cleanser decyl glucoside instead. Nourishing Cream Exfoliator/Gentle Exfoliator: Gives a light exfoliation with jojoba beads. I use this every morning! Nourishing Day Cream: Absorbs quickly and leaves skin so balanced, not greasy. It’s a mix of organic coconut oil, safflower oil, aloe, and antioxidant-rich acai. If you were only going to buy one moisturizer, this should be it! You can mix in some Lustro Oil drops with it at night to make it more hydrating. But if you can buy the Nourishing Night Cream, then that’s the ultimate to mix with the oil! Nourishing Night Cream: Just like the above, but it’s a more moisturizing formula. I mix in three drops of Oil #3 with this every night. Lustro Oil #3, now known as Balancing Face Oil: (Find out how to get this free below!) The lustro oils are a facial in a bottle. As I said above, just mix in a few drops with your moisturizer. I just do this at night. Oil #1 is to soothe irritated skin, Oil #2 is to brighten dull, aging skin, and Oil #3 is to balance dry or oily skin—and this one is best for acne! Rejuvenating Eye Cream, formerly known as the Vibrant Eye Perfector: This is the one Countertime product I am putting in this “must haves” list. It has caffeine and wild algae to reduce puffiness and darkness. Super hydrating, but not greasy! Vibrant Eye Perfector does not include parabens, which are common cosmetic preservatives that can disrupt hormone function, which is in turn linked to an increased risk of breast cancer. There are several different kinds of parabens (ethylparaben, butylparaben, methylparaben and propylparaben). Wash Everyday Body Wash: Cleanses skin without stripping it of natural moisture. Even Brandon uses it! Many other body washes contain sodium laureth sulfate — a common ingredient used in bath products that is often contaminated with 1,4 dioxane, a known carcinogen. Hydrate Everyday Body Lotion: I just love this stuff. The smell is so nice, but never overpowering. It makes my skin feel hydrated on it’s own, not like it has been slathered with lotion. It’s free of sulfates and penetration enhancers, which are often found in body lotions. But instead of hydrating, they can irritate skin and increase the amount of toxic chemicals absorbed into the bloodstream. Body Oil: I love mixing in a few pumps of this with my body moisturizer. It contains tons of incredibly nourishing ingredients. Also a great cuticle oil or to tame hair flyaways! Citrus Mimosa Hand Cream: I keep this in my nightstand to use before bed and one in my bag at all times! I can’t stand a sticky hand cream and this is not like that at all. Earn 15% product credit with every order. Special offers exclusively for members. …and until 9/1, anyone who joins will get an awesome free gift below, but only while supplies last, I’m told. So basically, you are just spending $25 to join and will get a $48 gift in return! Plus 15% back in product credit and free shipping!! BUT THERE’S MORE: As a member, you will also receive the #3 face oil for orders over $150! So that’s free shipping, free gift set, free face oil, AND 15% of the subtotal amount in product credit. And 8/23 and 24th, anyone who orders over $75 gets a free mascara! $29 value. Woo! That was a lot of info. If you followed me until the end… praise hands! If you want to see other posts I’ve shared about Beautycounter, including tutorials, you can see those here. I just joined the band of beauty program!! I couldn't pass it up and I put your name in the box! Crossing my fingers! I'm really thinking about becoming a consultant. I'm pretty passionate about this cause too! Is it something you feel has been valuable and a worthwhile investment aside from saving money on the products you love and buy? I ordered some Tint Skin from you and I LOVE it! I'm almost out…but paying $13 or so for shipping irks me when buying more expensive products. Do consultants ever bulk order to get around the shipping costs for their customers? I just wanted to comment that I went to check out and shipping is $6 not $13. I must be remembering Rodan + Fields shipping. But still, I hate paying for shipping!